The journey to a fully functioning data warehouse starts with identifying and moving data. We often hear developers ask: “How do we get our data into BigQuery?” Google Cloud partners with several extract, transform, and load (ETL) providers like Informatica, Talend, Stitch, and Matillion to make it easy for you to get started with BigQuery. Another essential tool for GCP users is the GCP Marketplace, which offers other options to get data into BigQuery. The GCP Marketplace offers many production-ready commercial and open source tools that work well with Google Cloud services. All the solutions in the GCP Marketplace are easy to deploy, verified against vulnerabilities, and optimized to run on GCP. They’re also designed to be easy to manage. Plot the path of a hurricane with real time data using the Geostationary Operational Environmental Satellite dataset from NOAA. Analyze historical patent data to find trends for certain industries, track expirations, or look for owners with Google Patents Public Datasets. After a quick Google search (useful tool, right? ), they found Matillion ETL on GCP Marketplace. The architect and his team liked the usage-based pricing model of Matillion. As with any commercial service launched from GCP Marketplace, support is offered by the partner, and usage charges are combined with charges for other Google Cloud services you may be using, so there’s just one bill. BigQuery is one area where GCP Marketplace can help you get started, and there are plenty of others. 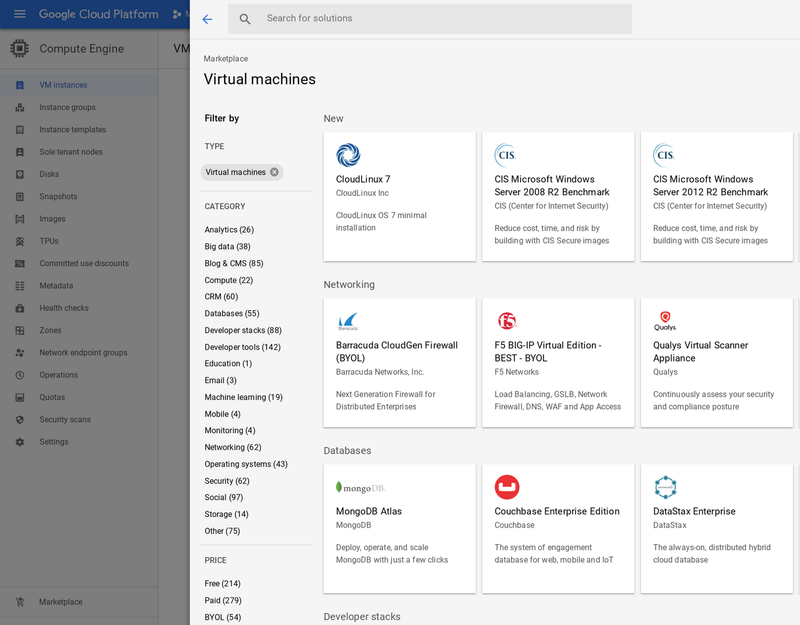 We’ve heard from users looking for a fast way to begin a new AI project who find our deep learning virtual machine template in the GCP Marketplace particularly useful. Starting with this template instead of configuring a GPU-enabled VM by yourself can save time and energy that can otherwise be spent building your next application. You may be searching for ways to accelerate hybrid development within your organization and find Kubernetes applications that can be deployed quickly to Google Kubernetes Engine (GKE) or anywhere you have a Kubernetes cluster. Whatever project or initiative you’re working on, you can choose from more than 1,000 commercial, open source, and Google-built tools in the GCP Marketplace. There’s also new AI-powered technology that will examine your Google Cloud environment and give you recommendations for GCP Marketplace tools. In addition, you can reach the GCP Marketplace from within Google Compute Engine and Kubernetes Engine. You can see here what the view into GCP Marketplace from Compute Engine looks like. If you are working on your own BigQuery project, check out the solutions on GCP Marketplace and find what’s right for you. And to see what’s new, what’s popular, and what is recommended for your environment, visit the GCP Marketplace page in the Google Cloud Console.